Now that Opera has gone the way of the Chrome, Firefox is the only browser left standing that is offering a sidebar to its users. Well, there are spin-offs and all, but if you only look at > 1% market share, you will only find that Firefox supports the feature. You can display the bookmarks or the browsing history by default in the sidebar. Many Firefox users are probably unaware of that feature due to the hiding of the menu bar where it can be accessed from. While it is theoretically possible to trigger the sidebar display with shortcuts, Ctrl-B for the bookmarks sidebar and Ctrl-H for the history, it is unlikely that many users will stumble upon those by accident. 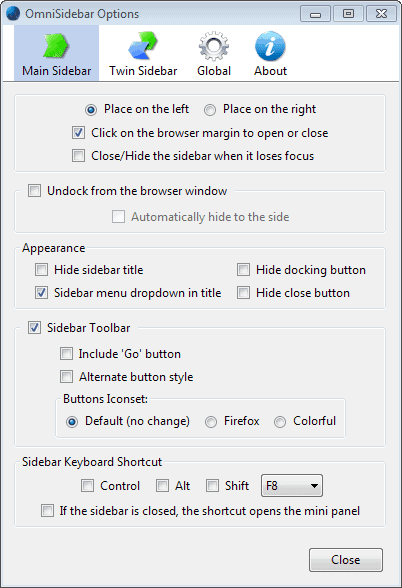 OmniSidebar is a highly rated extension for Firefox that improves the sidebar in many ways. It is similar to All In One Sidebar, but a lot easier to use and streamlined except for one feature that I'll address later in this review. When you install OmniSidebar in Mozilla Firefox, a single icon is added to the browser's address bar. It offers one option to toggle the sidebar display, but acts as a mini menu of sorts as well if you right-click it. The two buttons next to the title turn the sidebar into a floating window on the screen, and close the sidebar again. You can trigger the sidebar in other ways as well. You can hit F8, the default shortcut to do so, or enable the browser margin trigger which displays it when you move the mouse to the browser margin and click there while it is hidden. As far as options go, there are plenty. You can for instance move the sidebar from the left to the right, or, if you have lots of screen space, add a second sidebar to the right instead so that you can access two sidebars at once in Firefox. Here you can also hide some of the buttons and information displayed by the sidebar, modify the keyboard shortcut, disable transition effects to improve performance, and change delays. Another useful feature is the ability to always open select Firefox pages in the sidebar. You can for instance configure downloads and the add-ons manager to always open in the sidebar, regardless of how they are triggered. A sidebar can be useful, especially if you have the screen space available to display it without interfering with the websites you display in Firefox. The one thing that I'd like to say is an option to display the various menus that you can display in the sidebar as buttons on the border of the browser window. All In One Sidebar supports that feature, and Opera did too with its Panels. This should improve accessibility a lot for some users. 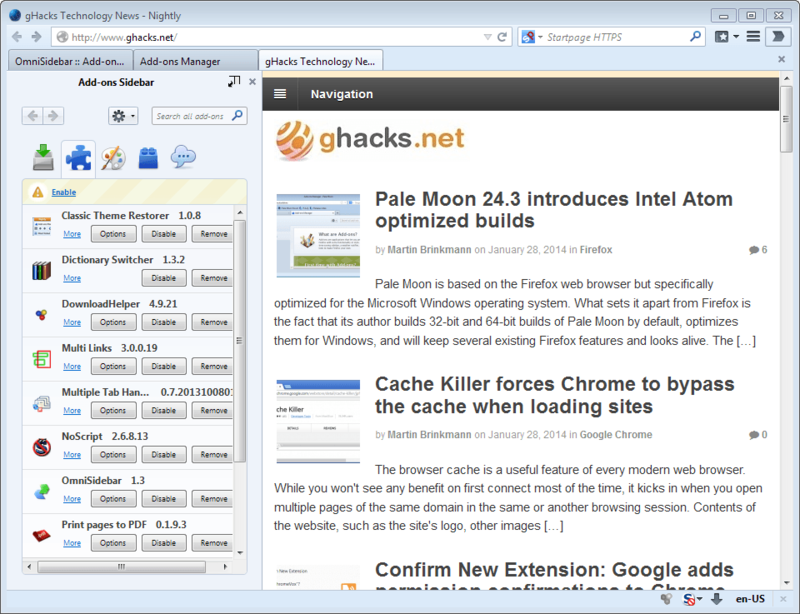 All in all though it is a great add-on for the Firefox browser. I have been using the sidebar for many years to access personal files and tools on my hard drive. A very good extension. AiOS development has stopped (the dev moved to Chrome) so OmniSidebar became the sidebar of my choice. I hope somebody makes such extension for Chrome as for me (2000 bookmarks) not having a sidebar makes a browser unusable. Anyway, it’s possible the developer’s primary focus might have moved elsewhere — I have no idea — but All-in-One Sidebar doesn’t seem to have been abandoned. One thing I like the best is the fact, that you can scroll with the mouse wheel while you’re at the very left/right border over the highlighted blue browser margin. No other sidebar extension with an open/close function by clicking on the page margin has that feature. I run both Firefox 32-bit and Pale Moon 64-bit, with Firefox as my main browser due to the greater availability of plug-ins for it (for now). I’ve had the All-in-One Sidebar extension installed in both for a long time, but, prompted by this article, I decided to disable AiOS in Pale Moon and give OmniSidebar a try. Anyway, so far I’m not seeing any compelling reasons to switch from All-in-One Sidebar to OmniSidebar. I’m used to AiOS’s interface and options and it seems a touch more responsive than Omni (apart from the new add-ons issue). However, I’ll probably keep using OmniSidebar in Pale Moon for a while longer and see if anything impresses me enough to make a permanent switch.